“Craig & Jared\'s workmanship, and knowledge resulted in an amazing renovation. We are thoroughly pleased with our new shower enclosure and highly recommend them for the job they did for us." “Craig and Jared did an excellent renovation/conversion on our bath/shower area of our bathroom. We highly recommend them. They were professional, innovative and used high quality materials and equipment." “We have all heard about reno nightmares and I worried about getting one done. My basement washroom was cheaply done straight out of the 70\'s and needed to be completely gutted. Jared just did it this past week. OMG, you wouldn\'t believe what a miracle-worker he is. It turned out better than I ever imagined. 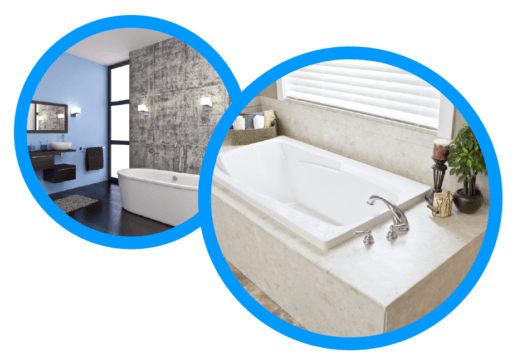 Jarod, you did a stupendous job and I wouldn\'t hesitate to recommend 5 Star Bath Solutions to anyone. I look forward to getting my main bathroom done, and can hardly wait. " “What a great experience & a great job. Everything was done as promised & looks wonderful. Chris was a pleasure to have in our home. He was very professional & his work excellent. Our little dog misses him already." “I love my new shower! Five Star Bath Solutions did a great job. Finished ahead of schedule and work was done in a totally professional manner. My condo was left looking as though nobody had ever been there, and my new shower had just magically appeared. Thank you so much Chris and Andrew"